Like many cities in Israel and Palestine, Bethlehem is biblically important to Judaism, Christianity and Islam. For Jews, Bethlehem (Bet Lechem) is the burial place of the matriarch Rachel and the birthplace of King David. Additionally, Samuel anointed David as king of Israel in Bethlehem (I Sam. 16:1-13) and David's ancestors - Ruth and Boaz - were married in Bethlehem. For Christians, Bethlehem is recognized in the gospels of Matthew and Luke as the birthplace of Jesus and is one of the religions holies sites around the world. The town is inhabited by one of the oldest Christian communities in the world, though many Christians have fled the city out of fear of persecution by the Palestinian Arabs. 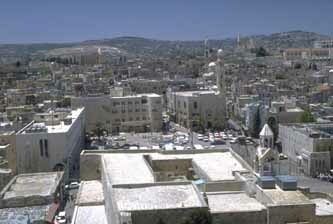 Bethlehem was first settled by Canaanite tribes who name the city Beit Lahama. They built a temple to the god Lahama on the present mount of the Nativity. Around 1200 BCE, the Philistines had a garrison stationed in Bethlehem because of its strategic location. Following the Israelites rule, the Greeks occupied the region unitl the arrival of the Romans in 160 BCE. The city, located just 5 miles south of Jerusalem, was turned over to the Palestinian Authority as a result of the 1995 Israeli-Palestinian Interim Agreement. Bethlehem has a population of roughly 30,000 people, a number which has been in steep decline over the past decade as the majority of Christians in the city have emigrated out of the Palestinian territory. In Hebrew, the town is Bet Lehem ("House of Bread") and in Arabic it is called Bet Lahm ("House of Meat"). For hundreds of years, Christian pilgrims have made the roughly 2½ hour walk from Jerusalem to Manger Square. Today, the trip typically begins at the train station in Abu Tor and proceeds along the Hebron Road. The Church of the Nativity was built in the 4th century by the mother of the Byzantine Emperor Constantine. Helena also was the person responsible for the construction of the Church of the Holy Sepulcher in Jerusalem. The present building, the oldest church in Israel/Palestine was reconstructed in the 6th century by the Emperor Justinian (527-565) and further repaired by the Crusaders. In 1250, the Ayyubid Dynasty was replaced by the Circassian Mamlukes, ruled by the fanatical Sultan Beibars. In 1263, Beibars ordered the destruction of the fortifying walls and towers of Bethlehem, but the church was spared. During the Turkish occupation in 1517, the Franciscans and the Greeks fought over control of the Sancutaries. Following the War of Independence in 1948, Bethlehem fell under the control of the Jordanians. Then after the 1967 Six Day War, the Israelis took control over Bethlehem. Today, there are many churches present in Bethlehem. The Greek Orthodox have 15 churches and institutions; the Roman Catholics have 25; there are 8 Protestant churches; the Syriac Orthodox have one church and the Greek Orthodox have two churches; and the Ethiopians and the Copts each have one. There are also several Mosques, including the Mosque of 'Umar, across the street from the Church of the Nativity. This mosque was erected in 1849. The traditional midnight mass celebrated on Christmas Eve is held in St. Catherine's, the Roman Catholic church next door to the Church of the Nativity. This is also the site of several chapels with their own historic and religious significance. The Chapel of St. Jerome is where the Bishop of Bethlehem translated the Old Testament into Latin. The Chapel of the Innocents is devoted to the deaths of the babies killed by Herod. The Chapel of St. Joseph is where an angel appeared to Joseph and commanded him to flee to Egypt. Not far from Manger Square is the Milk Grotto. According to Christian tradition, this is where Mary spilled some milk while nursing Jesus when she was hiding from Herod's soldiers. The milk turned the rocks of the cave a chalk white color. The rock is believed by some to have healing power and to make nursing easier for women. Other pilgrimage sites include the Shepherds' Fields, where an angel appeared to the shepherds to announce the birth of Jesus (Luke 2:8-20), the Field of Ruth, where Ruth, the Moabite, gleaned barley from the field for her future husband, Boaz, and David's Wells, three cisterns from which King David longed to drink when the Philistines controlled Bethlehem (2 Samuel 23:13-17). According to the Bible, Jacob's wife, Rachel, who had long been unable to conceive, died while giving birth to Benjamin (Genesis 35:19). She is the only Matriarch not buried in Hebron. Rachel's Tomb is inside a domed building built in 1841 by Sir Moses Montefiore. The tomb originally consisted of 11 stones laid flat, with one stone above the others. Legend holds that Jacob's 11 sons placed the first stones and their father added the last one. Jewish women, in particular, make pilgrimages to the site to pray for children. Muslims also consider the place holy and built a cemetery nearby. The Palestinian Authority pins much of its hopes for attracting tourism to Christian pilgrimages to the birthplace of Jesus. Consequently, million of dollars have been poured into this town to develop roads, shops, hotels and the other necessities for accommodating visitors. 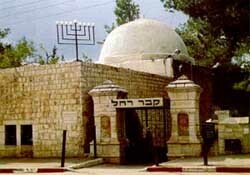 Though Rachel's Tomb is also in Bethlehem, and is a site of Jewish veneration, it was never a very popular attraction for Jewish tourists. Now that the city is completely under Palestinian control, it is even less so. Just south of Bethlehem is another of Herod's palaces. This one, known as Herodian, was built on the flat top of a cone-shaped hill, nearly 2,500 feet (758 meters) above sea level. Herod's architects actually shaped the mountain to make it symmetrical. The fortress was built in the first century, and like Masada, became a stronghold of the Zealots in the Great Revolt against the Romans. It was also used by the Jews during the Bar Kokhba revolt. The palace has 70 foot high walls and towers that rise 100 feet above the floor of the fortress. A synagogue, mikve and storerooms have been excavated on the site. The path to the fortress was originally marked by 200 marble steps. From atop the hill, the palace has a commanding view of the Judean Desert, Dead Sea, Bethlehem and the Jerusalem suburbs. According to the historian Josephus Flavius, Herod was buried here, but his final resting place has not been found. The Mar Saba Monastery was founded by St. Saba of Capadocia in the 5th century. This is a stereotypical monastery where reclusive monks spent years in caves without communicating with anyone. Over the centuries, invaders razed the monastery, but it was rebuilt by the Russian government in 1840. The bones of St. Saba, which had been taken to Venice by the Crusaders, were returned after Pope Paul VI's visit to Israel in 1964 as a goodwill gesture toward the Greek Orthodox Church. The skulls of monks killed through the years are kept in a chapel in the monastery. Even today, women are not allowed inside the monastery. Two other monasteries are in the Bethlehem area. One is Mar Elias, which was built in the 6th century. According to legend, this is where Elias rested on his flight from the vengeance of Jezebel. The St. Theodosius Monastery was built in 500 C.E. Christians believe the wise men rested here after God warned them in a dream they should not return to Herod. Also south of Bethlehem, on the way to Hebron, are three giant cisterns known as Solomon's Pools. In truth, they are part of a water system built 2,000 years ago during Roman times and used to supply water to Herodian and Jerusalem. In 1935, Shmuel Holtzman, a citrus grower, started a settlement he called Kfar Etzion. The Arabs destroyed the settlement and crops in 1937 and it was abandoned. In 1943, Jews returned to the area and again planted crops and introduced light industry. By 1948, a group of Jewish settlements had been established that became collectively known as the Etzion Bloc. During Israel's War of Independence, Arab invaders attacked and killed most of the residents. When one group of 14 Jews were surrounded by Arabs when they attempted to return to Kfar Etzion from Jerusalem, they blew themselves up. Another 35 were killed when they tried to lift the siege on the area. The area, just north of Hebron, was part of Jordan from 1949-1967 and used by the Jordanian army. Following the 1967 war, Jews (many survivors from 1948) returned to resume farming in the area. Local kibbutzim and moshavim have produced turkeys, flowers and candles. Kibbutz Kfar Etzion has a museum recounting the history of the Jews in the settlements.